Posted on Tue, Jan 24, 2012 : 2:57 p.m. Many downtown Ann Arbor businesses — especially Jerusalem Garden and Earthen Jar, which are located here on the closed section of Fifth Avenue — have been waiting anxiously for the street to reopen. The street has been closed to traffic since September 2010. 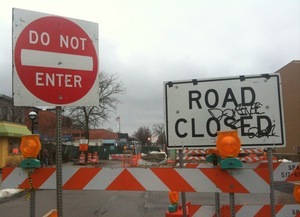 South Fifth Avenue will not reopen to traffic between Liberty and William streets in downtown Ann Arbor this month like officials had hoped. Susan Pollay, executive director of the Downtown Development Authority, said crews are working hard on the underground parking structure project that has kept Fifth Avenue closed, but they won’t have the street open by the end of January, which was the goal. Pollay said she doesn't have a firm estimate for when the road will reopen, as the remaining work involves waterproofing, which is temperature- and moisture-sensitive. These signs remain standing at the corner of Liberty and Fifth Avenue in downtown Ann Arbor. "But a great deal of work is moving forward every day, including pouring concrete walls, installing the electric system and lighting and more," she said. Many downtown businesses — especially Jerusalem Garden and Earthen Jar, which are located on the closed section of Fifth — have been waiting anxiously for the street to reopen. The street has been closed to traffic since September 2010. Owners of both restaurants have spoken out before the Ann Arbor City Council, saying they've been hurt because of the construction. They also said they think they deserve some form of compensation from the city or the DDA. Mayor John Hieftje said in July he wasn't sure what more the city could do for the businesses, but he noted Fifth Avenue was expected at that time to reopen by Dec. 31. Pollay later indicated in November the DDA was aiming to open the street sometime in January. The DDA is funding the $50 million underground parking structure, which will be owned by the city. Remaining work on the project is expected to continue into the spring. DDA officials held a ceremonial groundbreaking to kick off the project in September 2009, though it was some months later before major work was under way. The deck is expected to include somewhere around 700 parking spaces. It originally was expected to open in August 2011. But by late 2010, due to a delayed start, project officials said it wouldn't be finished until December 2011 or January 2012. The project manager for contractor Christman Co. offered an update on the timeline last July, saying the project would be finished in spring 2012. The latest estimate from DDA officials is that the garage will be open in time for the Ann Arbor Art Fair in July. Thu, Jan 26, 2012 : 6:18 a.m.
<a href="http://www.lamag.com/features/Story.aspx?ID=1568281" rel='nofollow'>http://www.lamag.com/features/Story.aspx?ID=1568281</a> &gt; "For 5,000 years," says Cole, "we built cities around people, and they worked well. &gt; For 50 years we've built them around the parking lot—a ridiculous use of land, of money, &gt; and an intrusion into the intimacy of human scale. Wed, Jan 25, 2012 : 12:03 p.m.
You know, the City Hall fountain thing hasn't been closed up yet either. The thing that was supposed to be done before Thanksgiving? The $750,000 thing? Does anyone recall there being something fishy about how Christman Co. got this contract? I tried Searching A2.com for &quot;Christman&quot; and couldn't find it, but I could swear there was some shady thing happening, like someone working at Christman was related to someone in Council or DDA, or SOMETHING. Ryan, would you be able to find that? And by the way, readers should search A2.com for &quot;Library Lot&quot; or &quot;Christman&quot; and refresh your memory about this whole thing; it's been an absolute ridiculous disaster from the very start. Ryan, does the DDA use our property tax money to fund this? And is there a place where we can see the ACTUAL money being spent on it? Like not just the estimates, but the actual? And I second the request to find out if there is ANYTHING in the library lot contract about compensation to the DDA or city if there are delays of certain amounts of time (like multiple years for God's sake, I mean REALLY). Wed, Jan 25, 2012 : 4:59 a.m. I'm curious why the road needs to remain closed while the structure is waterproofed. Is that really a process that traffic would impede? Wed, Jan 25, 2012 : 3:56 a.m.
Perhaps the city could donate a piece of art for their front yard as compensation ? that really adds value like that thing in front of my city hall 750K seriously? Any news on what the DDA plans to build on top of 'their' structure when they get that part done? This has dramatically changed the city forever. Wed, Jan 25, 2012 : 2:43 a.m.
Really? Well that's a big surprise! I'll be gobsmacked if it even opens up at all. Wed, Jan 25, 2012 : 2:34 a.m. I don't care about when the structure opens, you open 5th Ave and I'll be one of the happiest people on that road. You couldn't miss me, I'll be the one with the ear to ear grin Lol!!! Wed, Jan 25, 2012 : 2:27 a.m.
as if anyone believed it. boondoggle. Wed, Jan 25, 2012 : 12:53 a.m. I am completely shocked! Not! &quot;The latest estimate from DDA officials is that the garage will be open in time for the Ann Arbor Art Fair in July.&quot; Yes, but what year? Tue, Jan 24, 2012 : 10:25 p.m. These delays are just ludicrous. I have never seen these kinds of repeated delays. I certainly hope the city will levy some steep fines and provide specific explanations regarding delays. Traffic has been tangled because of this nonsense for 3 years. FAR too long! Tue, Jan 24, 2012 : 11:20 p.m.
Um...last I checked there is a bridge out on Stadium. They say it should be done by years end? Maybe? Tue, Jan 24, 2012 : 10:13 p.m.
Tue, Jan 24, 2012 : 10:10 p.m.
As the kids used to say, DUH! J. Garden and Earthen Jar should be thankful that the city didn't make them close during the construction. You want an update on when the road will reopen? It will reopen when the DDA says it will reopen. What are you gonna do cry to the Mayor? Wed, Jan 25, 2012 : 12:52 a.m.
Wow! Someone got up on the wrong side of the bed. Tue, Jan 24, 2012 : 11:19 p.m.
With the amount we have borrowed from the? Might as well be. Tue, Jan 24, 2012 : 10:14 p.m.
Tue, Jan 24, 2012 : 9:58 p.m. The Ann Arbor DDA is a failure. They should admit they blew this and they should compensate both of those businesses. Tue, Jan 24, 2012 : 9:46 p.m. Wed, Jan 25, 2012 : 2:45 p.m.
Tue, Jan 24, 2012 : 11:18 p.m.
More translation? July equals The Art Fair! What more lovely headaches can we get? Tue, Jan 24, 2012 : 9:52 p.m.
Tue, Jan 24, 2012 : 8:35 p.m. Wed, Jan 25, 2012 : 3:44 p.m.
Oh, yeah - that's a good comparison. Tue, Jan 24, 2012 : 8:34 p.m. This is what happens if you do not contribute to the re-election of certain members of Ann Arbor City Council. They start a project that disrupts your business an will not complete it until you are out of business! I wonder if they are doing this because they serve Middle Eastern food? Tue, Jan 24, 2012 : 8:32 p.m.
Tue, Jan 24, 2012 : 8:29 p.m.
Tue, Jan 24, 2012 : 8:23 p.m. I love Jerusalem Garden. Finish the money pit. The 4-way stop has been there too long! Tue, Jan 24, 2012 : 11:17 p.m.
Never been there. Heard of it, but nope don't know anything about it. I do know Champions is now gone and with it? Parthenon. Wow. Wed, Jan 25, 2012 : 2:57 p.m. Wed, Jan 25, 2012 : 2:06 p.m. Wed, Jan 25, 2012 : 3:43 a.m.
Tue, Jan 24, 2012 : 10:07 p.m. If the DDA paid for it, it's not &quot;your&quot; money, unless you live within the development district in a building completed since 1982. The DDA is financed with tax increment financing on new development built within the downtown district after 1982. See <a href="http://www.a2dda.org/about_the_dda/how_we_are_funded/" rel='nofollow'>http://www.a2dda.org/about_the_dda/how_we_are_funded/</a> The DDA has done a terrific job managing the parking garages downtown, which previously were poorly maintained by the city government. The city council won't disband the DDA because it is a revenue generator, despite all the Bolshevik squealing. Tue, Jan 24, 2012 : 9:11 p.m.
&quot;Mayor John Hieftje said in July he wasn't sure what more the city could do for the businesses&quot; Seriously, give these two businesses some financial compensation comparable to the income that they lost and maybe even a little extra for pain and suffering. Jerusalem Garden and Earthen Jar deserve something other than empty promises that construction will be done soon. Construction ALWAYS takes longer than promised, is noisier than promised, blows dust and exhaust everywhere, and don't forget the sinkhole incident that almost destroyed the Earthen Jar's building and could have easily gobbled up a car in the back driveway. A $50 million project must have included some sort of compensation analysis for nearby businesses. Right? Right, city council? Wed, Jan 25, 2012 : 3:57 a.m. If and when it does open the few people who do park in it will have to dodge the pan handlers sleeping on the heated ramps. Wed, Jan 25, 2012 : 3:52 a.m.
All the money THEY could have used is being chucked at the cross walks to figure out out how to make that bad idea work. Tue, Jan 24, 2012 : 8:22 p.m.
Tue, Jan 24, 2012 : 9:51 p.m.
not only raised, but no longer are there half hour increments....parking validation now takes two of those little stamp things. Tue, Jan 24, 2012 : 8:19 p.m.
Ryan Could you find out if there is a completion guarantee on the project? Tue, Jan 24, 2012 : 9:12 p.m. I think its sad they can put all these businesses in tuff spots and trust me not just the two they allways talk about it has hurt many downtown businesses just open the street. I dont care about the structure anymore it's not going to bring in anywhere the amount of traffic it has prevented. JUST OPEN THE ROAD. Tue, Jan 24, 2012 : 9:05 p.m.
the DDA is ran by the same people who run the goverment in ann arbor. Tue, Jan 24, 2012 : 8:37 p.m.
Tue, Jan 24, 2012 : 8:33 p.m.
Of course there isn't. Why would the city hire a contractor and hold them accountable? What do you think this is, the private sector? Tue, Jan 24, 2012 : 8:15 p.m.
&quot;Pollay later indicated in November the DDA was aiming to open the street sometime in January.&quot; Maybe a bit of wishful thinking, that. 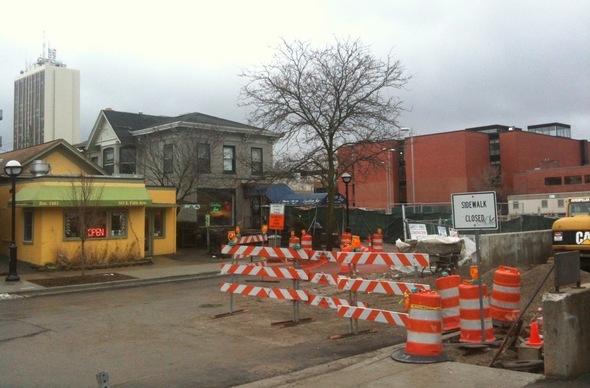 And so the Ann Arbor Big Dig saga continues. Tue, Jan 24, 2012 : 8:10 p.m. This has been an incredibly warm winter - and they can't get finished on time? I sure hope that the DDA had some kind of on time completion requirement with a penalty for being late in the contract. Maybe they could use part of it on behalf of the businesses in the area which have suffered so much because of this project - which still hasn't shown it will actually provide any benefit to the community.